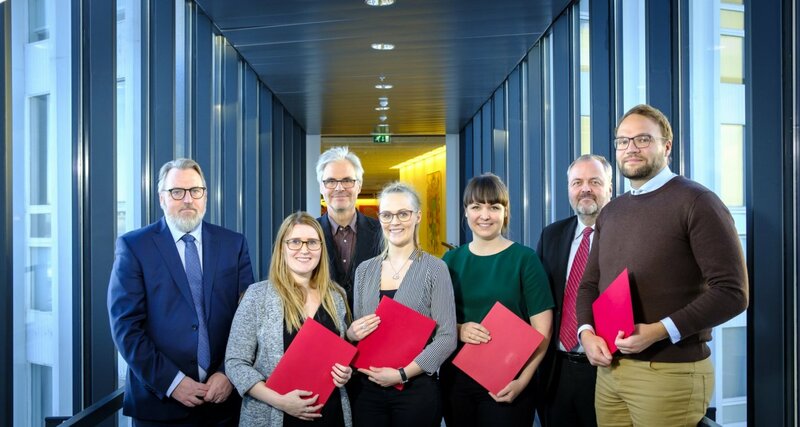 Five students at the University of Iceland's Faculty of Business Administration recently received an award for their contribution at an international competition organised by Harvard Business School. The University of Iceland is one of 122 universities worldwide that teaches the course Microeconomics of Competition based on a model from professor Michael Porter et al at Harvard. The course, Microeconomics of Competitiveness, is offered as part of the MS studies in the University of Iceland's Faculty of Business Administration. The forty-seven students who were enrolled in the course during the autumn semester of 2017 completed it with an extensive team project, or cluster analysis, presented in class. In addition the students wrote an individual report on the subject. The course's supervisors; Runólfur Smári Steinþórsson and Gylfi Magnússon, consequently nominated one of the student projects to the competition organised by the Institute of Strategy and Competition with Harvard Business School. The project was on the Stockholm music cluster and is entitled Thank you for the Music: The Stockholm Music Cluster. The authors were Aldís Sunna Ólafsdóttir, Aldís Sveinsdóttir, Björk Gunnarsdóttir, Hjörtur Örn Eysteinsson and Kristín Sverrisdóttir. The project landed in third place in the competition and all authors received an award document. The course's supervisors and the head of faculty, Ingi Rúnar Eðvarðsson, presented the documents. Kristín Sverrisdóttir is not in the picture as she lives abroad.